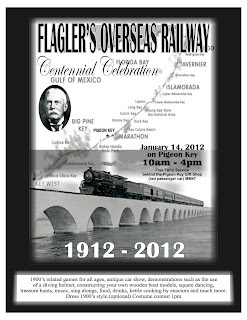 Historic Pigeon KeyBill & Mary Burnham, authors of the “Florida Keys Paddling Atlas,” will lead a free paddling trip from Knight’s Key, under the Seven Mile Bridges, out to historic Pigeon Key for the Marathon Flagler Centennial Celebration on Saturday, Jan. 14, 2012. Bring your kayak to Knight’s Key Campground for the 9 a.m. launch. Burnham Guides will be providing some for free: Call 305-240-0650 or email mary@burnhamguides.com to reserve one. Enjoy the Family Fun Day, from 10 a.m. -4 p.m., featuring reenactments, free kayaking, demonstrations, period games, dancing, music and food. Dress 1900s-style for the 1 p.m. costume contest! The Burnhams will give a slide show and book-signing at 11 a.m.